lt;stronggt;ECOEPBRHC16EWlt;/stronggt;lt;BR/gt;ECO-PRODUCTS,INC. 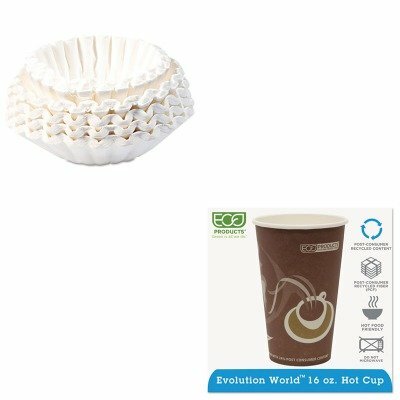 Evolution World 24% PCF Hot Drink Cupslt;BR/gt;Sturdy and dependable cups made from recycled fiber. Leak-proof interior lining and comfortable, smooth-rolled rim. Cup Type: Hot Capacity Volume: 16 oz Materials: Paper Colors: Purple.lt;BR/gt;lt;BR/gt;lt;stronggt;BUN1M5002lt;/stronggt;lt;BR/gt;ECO-PRODUCTS,INC. Evolution World 24% PCF Hot Drink Cupslt;BR/gt;Fits 1.5-gallon coffee brewers. Stay-in-place design. Special paper assures optimum brew. Number of Cups: 12 Materials: Paper Shape: Flat Bottom.